Watch a New Trailer for The Quest of Alain DucasseThe documentary hits theaters and VOD on June 8. French Chef All-Stars Plan to Retaliate Against ‘Anglo-Saxon’The first order of business is inviting Steven Spielberg to dinner, for some reason. Alain Ducasse Says French-Food Defenders Must Be ‘Very Vigilant’Just say non to fast-food hamburgers. Alain Ducasse Launching Paywalled Food WebsiteThe chef will school you now. Alain Ducasse Is Not Afraid of Chaud-FroidThe chef also says he’d be “very frustrated” if he could only have one restaurant. Win a Signed Copy of J’aime New York by Alain Ducasse and DinnerAll you have to do is tweet. Le Horror: Paris Restaurants Serve Mass-Produced Tarte Tatin and Frozen LentilsPaul Bocuse is watching you — he sees your every move. Today France Debated Which Restaurants Can Call Themselves ThemselvesIt’s made from scratch or from nothing at all, the chefs say. Some More Crazy Details About Pinch, Alain Ducasse’s Casino Restaurant inBecause he can. Ducasse-Led Chef Group Creates New ‘Quality Restaurant’ Seal ofIf they like your food, you get a plaque to hang outside your kitchen. 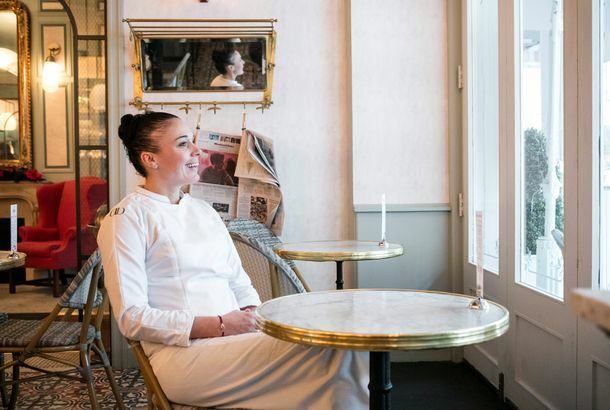 Former Ducasse Chef Didier Elena Launches Food & Wine Chefs ClubIt’s like the brotherhood of the traveling chef’s pass, or something. From Teamster to Taquero: Q&A With Guerrilla Tacos’ Wes AvilaThe Pico-Rivera local tells us a brick-and-mortar might be around the bend. David Kinch, Daniel Patterson, Wolfgang Puck Among 240 Chefs Flying to Monaco toFor three days, November 16 to 19, 240 of the world’s best chefs will all be in one place, kissing one ring. C’est Fini: Alain Ducasse Will Close AdourThe restaurant in the St. Regis will close after service on November 17. Alain Ducasse to Host Intense Chef Summit in Monte Carlo [Updated]David Chang will party down with Joël Robuchon. Alain Ducasse Shows Off His Favorite Spots; Get a Great Deal atPlus, Alain Ducasse says ‘J’aime New York’ (and so should you), and more in today’s leftovers. Alain Ducasse Eats New YorkOui, chef. Rory Herrmann Exits Bouchon Beverly HillsThe chef is known for his skill and an inspiring weight-loss. Julien Jouhannaud Is Adour’s New ChefA tres important Ducasse alum. Adour Alain Ducasse Launches ‘Nature’ Menu to Promote New BookThe $85, five-course menu features items like cucumber gazpacho and steamed snapper with seaweed. Didier Elena Bids Adieu to AdourThe head chef is out at Alain Ducasse’s restaurant in the St. Regis. Newly Proposed Rules Could Limit Outreach to the City’s Homeless and Hungry;Plus: Obama passes on shark fin soup; and Gordo gets dumped in Montreal, all in our morning news roundup. Ducasse Revs Up for Season’s Second Royal WeddingPrince Albert of Monaco and Charlene Wittstock have grand wedding plans: a meal by Alain Ducasse. Even Las Vegas Loves Paul Bocuse!Chefs like Guy Savoy and Joël Robuchon will team up to cook dishes that are influenced by the respected French toque. Thomas Keller Goes From French Laundry to French Legion of HonorThe ceremony was attended by Daniel Boulud, Eric Ripert, and others. What Do Chefs Eat When They’re Alone?French masters prefer pasta. SOBE Report: Event OverloadA look at yesterday’s numerous parties. Alain Ducasse Plugs His New App With CanapesMeet Ducasse, score food and drink from Benoit, and hear about his new iPhone app. Keller and Ducasse Vacation in Barneys’ WindowsWho are the “Gals of Food” and the “Bad Boys of Food”? Finally Confirmed: Didier Elena Is New Chef at Adour Alain DucasseHe’ll try to win back the Michelin star that was lost under Joel Dennis. Confirmed: Joel Dennis Leaves Adour Alain DucasseThe interim chef will be a Ducasse longtimer. Rumor: Didier Elena Replacing Joel Dennis at Adour?Is a two-star chef coming to Ducasse’s one-star restaurant? Cuozzo Diagnoses Alain Ducasse With Inferiority ComplexWhy did the French master put London’s restaurant scene above New York’s? Alain Ducasse Will Join Daniel Boulud on Pop-up TruckExpect other guests, too. Across the Pond: Ducasse Gets Michelin Upgrade, Oliver Announces Plans With AdamPlus, Gordon Ramsay is one of the greatest television chefs. Vive La FranceA couple of breaths of life in the world of haute Français today.